Get a free exam, consultation and x rays if needed. "Where Sick and Well Families ~ EXCEL"
Upper Cervical Chiropractic Care is based on God's universal law of action and reaction. As we all know for every action there is an equal and opposite reaction. The brain, when it is 100% connected to the body, will have complete control to take healing action on the body, most importantly to our vital organs. The body will have a direct opposite reaction, by receiving the brain's messages and allowing the brain to heal every organ, tissue and cell. If there is an interference with the communication between the brain and the body, it will potentially cause the body to have sickness and disease. As Upper Cervical Chiropractors, we focus on removing that interference so the body will heal naturally without the use of potentially dangerous medications or unnecessary surgery. Upper Cervical Chiropractic Care is one of the fastest growing forms of Health Care in the world! In our office we focus on finding the cause of your symptoms instead of treating the symptoms themselves. As you may know the Brain itself controls all life in the body, including every vital organ, tissue and cell. There is not one thing in the body that it doesn't control. 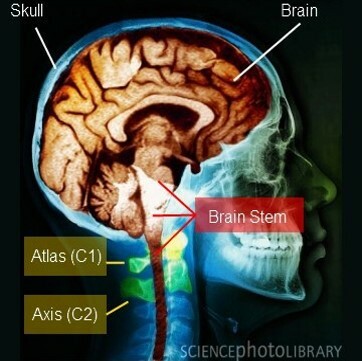 Inside the brain there is a main control center, called the Brainstem. This control center sits just inside the skull and extends down into the top two Vertebrae of the spinal column. The Brainstem then continues as the spinal cord throughout the rest of the spine. The brain and brainstem have a complex wiring system that has close to 70 Trillion nerve cells that pass through the top two vertebrae then out to the rest of the body. In most cases, when the body develops symptoms and becomes sick, it is due to a misalignment of the top two vertebrae. That misalignment could put pressure on the nerves and cause interference with vital brain messages that are meant to help our bodies to heal. This interference can cause distortion of messages, resulting in malfunction of things like hormones, blood pressure, breathing, stomach acid, and every other processes of the body. The Upper Cervical spine is made up of two bones, the Atlas and the Axis. This area is extremely vulnerable to injury and misalignment due to the fact it is the most mobile and most unprotected area of the spine. Injury to this delicate area can cause irritation to the nerves and cause detrimental communication from the brain to the body. Misalignments in this area, if not treated specifically and correctly, can lead to irreversible spinal degeneration and chronic health problems throughout life. How does this happen? Slips, falls, auto accidents, sports injuries, emotional stress, physical trauma, improper birth techniques and even the birth process itself. This is why our offices are family oriented and kid centered. Because as we grow from kids to adults, we all need this vital care! I was diagnosed with ulcerative colitis many years ago. It became very bad when I began to bleed. I went to my doctor and specialists and they had no answers of why it happened. The medications were not working anymore. It is very hard to do construction work when I have to go to the restroom 30+ times per work day. After the first month of treatment I had no more blood in my stool. Thank you UCCNC for helping me to get my life back!